The Deepwater Horizon oil rig exploded on 20 April 2010, sank two days later, and now the oil spill from the uncapped valve on the sea floor is causing an environmental emergency, about to wash ashore on the fragile Louisiana coastline. Ceres is also very strong in the horosope of British Petrolium, the owner of this disaster. This company was founded on 14 April 1909 as the Anglo-Persian Oil Company. You can see in the chart that Ceres is tightly square the Sun. 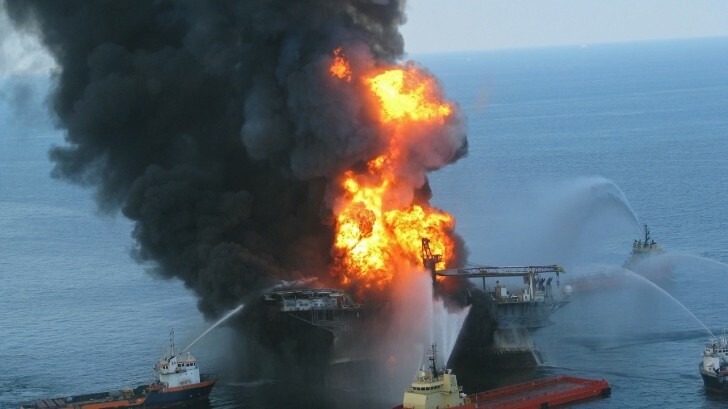 So the identity of this corporation faces tests and challenges regarding environmental issues, ranging from disasters such as this explosion and oil spill, to global warming and peak oil. The Solar Eclipse and New Moon aspected the Ceres configuration highlighting this as the major issue. Chiron is a deep wound, aspected by Neptune, which can represent oil and the ocean, but also deception and fraud. Now this gets interesting, as the BP chart has Saturn square Neptune, and transiting South Node was conjunct Neptune at the time of the explosion. The South Node can represent karmic debts from the past, and BP has a shady history. Saturn square Neptune well describes the deceptions and fraud surrounding the origins of this company and Iran. Bribes to Winston Churchill and a CIA coup. It’s no wonder Iran is test firing rockets over the Persian Gulf. Transiting Pluto trining the BP Jupiter is interesting, this is a fortunate aspect relating to big bussiness and wealth. BP profits for the first quarter of 2010 rose 135% compared to a year ago, as announced in a press release just two days ago. To add to what I mentioned about the role of Ceres conjunct Pluto, Pluto itself rules mining and deep underground. Deepwater Horizon had been working the Tiber oilfield, the deepest oil and gas well ever drilled. This is so very Plutonic, pushing the boundaries to the extreme, penetrating deeper than ever before. Pluto does demand payment for journeying to his underworld. [This horoscope was updated 29 May 2010 as a new time for the incident has been reported: “Around 9:53 p.m. CDT on April 20” – cnbc.com. The coordinates are from geohack. The event chart shows a Boomerang Yod aspect pattern. A Yod is formed when two planets quincunx another. Here it is the Sun and Neptune that quincunx Saturn. The Boomerang is formed when another planet is opposite the action point, in this case Uranus is at the reaction point. So the action point was Saturn, the structure of the oil rig. Quincunxs create a build-up of energy which needs constant adjustments to be released safely. If the energy bottles up too much then something has to give. Neptune oil and the ocean creating tension with the rig. The Sun made this special configuration for only a few days, and the pressure created by this extra quincunx is what makes these Yods so intense. The buildup of energy looks for release at the reaction point and Uranus is unexpected events, and explosions. The duration of this environmental catastrophe may be explained from the longer term transits. Even though the Sun set up this Yod in the short term, the slower moving planets; Saturn, Uranus and Neptune, will keep there current aspects within two degrees atleast until July 2010. Ceres moving retrograde now and away from Pluto may ease things in a few weeks but there are some seriously heavy duty transits ahead of us this year, and oil is still gushing uncontrolled from the sea floor. Jupiter getting closer to conjunction with Uranus could amplify the unpredictable nature of this event. Interesting transits to the event chart: Jupiter conjunct the chart Uranus 26 May 6:09 pm local time, hopes on changes, inovation and technology: “with more than 7,000 barrels of drilling mud applied by 7 p.m” CNN. So it looks like this new innovation got under way very close to the exact conjunction of Jupiter to Uranus. Mercury will conjunct Mercury 28 May 04:52 am. Hopefully some good news then. I appreciate funkastrology’s charting (altho I wish it were bigger)& explanation.. I went looking through “USA Today” for time & location of the BP explosion and found nothing definitive. So I do appreciate the 9:45pm CDT /88W18’58 x 28N45’14 information. But even on the printout I cannot read the Lat.x Long. and it doesn’t show the Deepwater rig explosion location. A better map showing lat/long. lines is a July 1991 Hurricane Tracking Chart of Suburbia-Reporter, a Houston Community Newspaper. ‘Feel like I’m doing cut & paste… bits of info from so many sources.. I just got thhe deepwater Horizons explosion chart enlarged & realized the printout shows the Longitude at 096W16’06 — that would put it between Galveston and Corpus Christi! A typo for sure. JK, when you click on the chart it enlarges. I have corrected the coordinated. Yesterday when I edited to the new time of 9:45pm I forgot to check it. The coordinates in the horoscope are from wiki. The explaination of the chart I gave is mainly about the Yod aspect pattern, with Saturn at the apex and Uranus at the reaction point. Thanks to Claudia Dikinis for finding the actual time of the explosion, posted on TMA Facebook Page. “Then rises the Southern Fish in the quarter of the wind after which it is named” [Manilius, Astronomica, 1st century AD, book 1, p.39]. That’s fascinating, especially the reference there to the Catholic Church, currently having such a mega challenging time. I see Exxon mentioned too. Nigeria has recently demanded action regarding Exxon Mobil oil spills there. Nick Campion’s meticulous Book of World Horoscopes gives two charts for Nigeria. 1st October 1960 (00.00,CET, Lagos) and 15th January 1966 (02.00AMCET Lagos) In both there are links to Piscis Austrinus.The Aquarian Moon in the 1960 chart. Mars in Aquarius in the 1966 chart. The 1960 chart for Nigerian independence shows 00 Cancer rising, with Mars at 04 49 Cancer, square Sun in Libra (07 46)…..So, another eclipse story perhaps? I’ve been experimenting with the fixed stars and mundane events for a while. The synchronicities are sometimes utterly amazing. I was really excited when I came across your website and saw you were on the same journey of discovery! As above, so below…..
Is a nuclear option really being considered? A few days before the June Lunar Eclipse conjunct Pluto, ruler of nuclear weapons, this report from a reputable website: oil-price.net/en/articles/nukes-to-stop-the-oil-gusher.php. Scary stuff. Yes very scary. Especially when you factor in Al Wasat and the upcoming solar eclipse in Cancer. It was conjunct Saturn in August 1945 when they dropped the first atom bomb on Hiroshima. But perhaps the talk of nuclear options is just symbolic of musings in the collective unconscious(we hope)because Al Wasat is activated by the eclipse? A theme rather than a concrete reality? Yes, I think the eclipse was actually closer to Wasat than to Castor, but they probably have an equal effect as Castor is brighter.